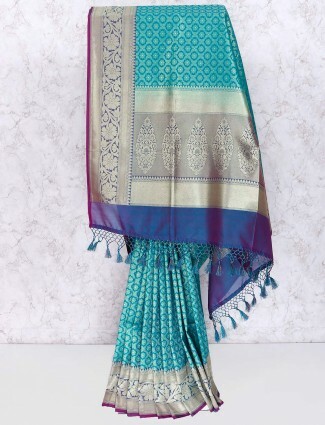 Styles in sarees to pick for a party occasion can be bold enough with colors or the statement embroidery of the saree can be the centre of the look. 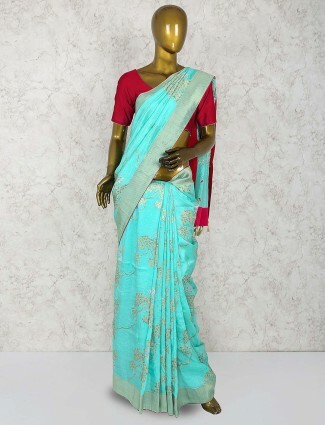 Our designer party wear sarees collection holds types to be chosen for wedding parties to formal event parties. 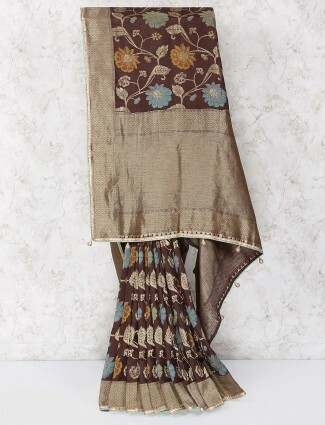 Pick party sarees for cocktail hour with bling or a thread work designer saree in dark colors for an event. 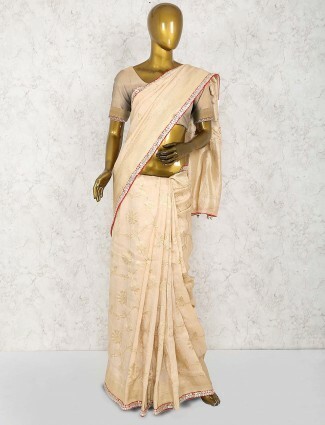 Plain silk party wear sarees have been the latest trends in embroidered borders and also the stylish satin and georgette party wear sarees collection is what you can’t miss to buy online with g3fashion.com from an affordable range. 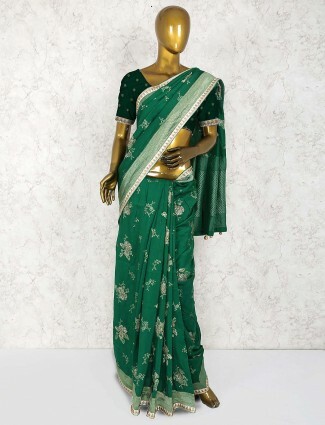 Sarees are the one attire which are still one of the favorite apparel categories in Indian fashion. Whether you are planning to attend a wedding party or any event to festive party, sarees have been the top choices for many women in India. 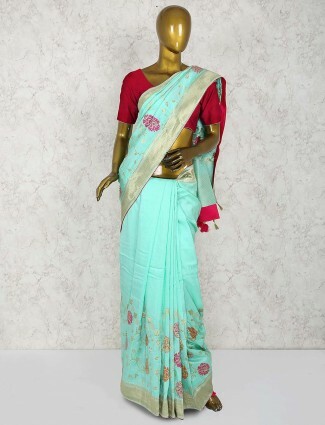 Shopping latest party wear sarees is now easy with G3+ collection which has a number of party sarees to choose from all price ranges and appropriate styles for any kinds of parties you need to attend. 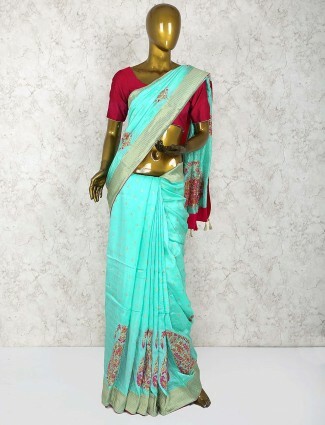 Buy Party wear sarees for indo western saree styles, being draped in new styles which give an indo western look. 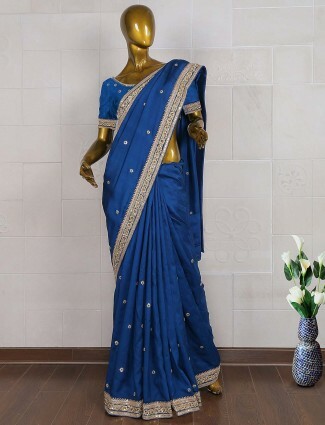 Party sarees for young ladies is a hype trend and their choices would be soft and easy to wear sarees like chiffon sarees, georgette party sarees, satin sarees, a work border saree are some styles which are most worn in all light weight which are easier to carry. While attending wedding parties or a sangeet, you can select party wear lehenga saree with price which are very affordable and have a designer saree look. 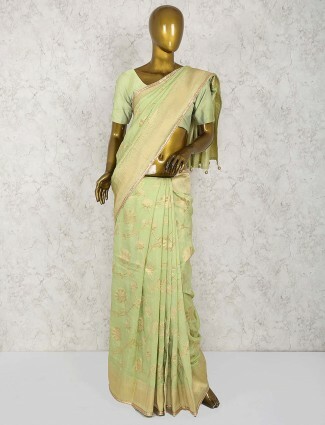 The saree is easy to wear as it is a pre-stitched saree consisting of a lower skirt portion and stitched pleats and the pallu or shoulder drape may be pre-pleated and stitched together to keep pleats neat before they are draped over the shoulder. These days we have seen Bollywood stars ditch the Indian fashion trend and move over to western silhouettes but, sarees still being flaunted by Bollywood divas at red carpet events to other parties. The saree gowns are a huge trend set by stars who flaunted sarees at parties. Bollywood designer party wear sarees are now available at G3fashion.com in different styles and some top styles which have been worn by Bollywood stars like the silk party sarees, the plain sarees with work border, plain saree with embroidered blouses and velvet sarees which are back in trend. 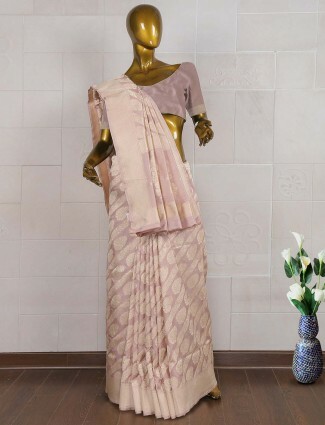 Apart from modern trends of party sarees, the traditional party wear sarees are also available with G3+ fashion in half and half styles, in shimmer fabrics, in lace sarees perfect for party look. 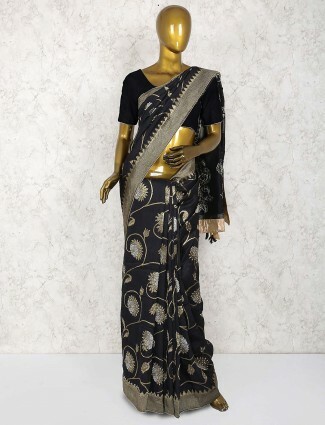 Shop from a designer range of colors which trend high in party wear looks like black party wear saree which can be worn in half and half or a black shimmer lace saree style. 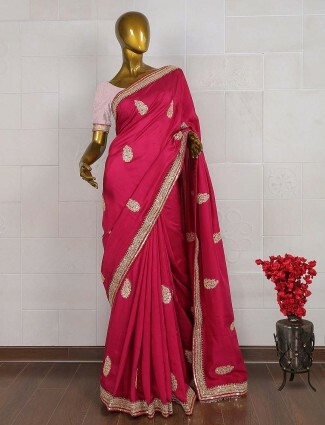 Go for pink saree with designer blouses or a party saree with cape style in various colours is the trend of the era and can be easily shopped online on our website. 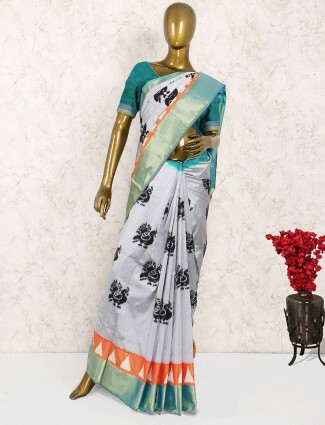 Coming up to styles in blouse designs being the most important part of dressing up in a saree has to be harmonizing with the party wear saree. When you have to choose party wear saree blouse designs remember to always go contrast not in terms of colors only but also can be contrast in terms of patterns and styles. 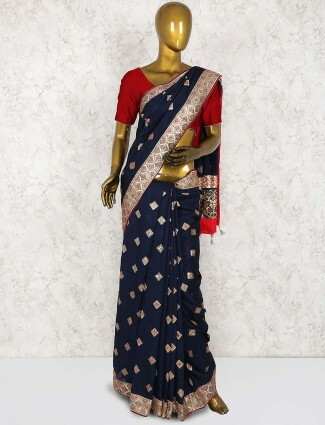 Like go for a net saree blouse design with a georgette saree or a chiffon party saree, go for velvet or brocade silk blouse to pair up for wedding party sarees. 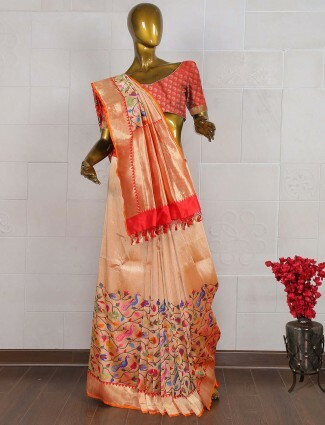 Add on a printed silk blouse design for a formal saree look and so many more to choose from saree blouse designs at g3fashion.com. Also go for stylish back neckline blouse designs, go for the bell sleeve blouse designs, tassel blouse designs for party sarees. 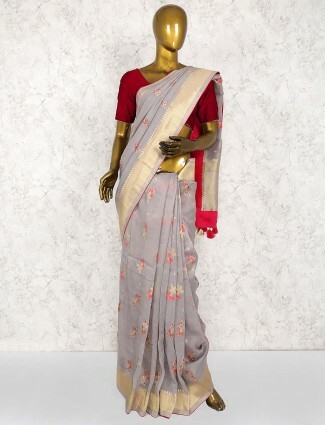 Today’s trend of party wear sarees is more focused on sober elegance which is not only embroidery but how a textured saree or a plain and printed saree is made dominant with rich fabrics, color combinations and style concepts. 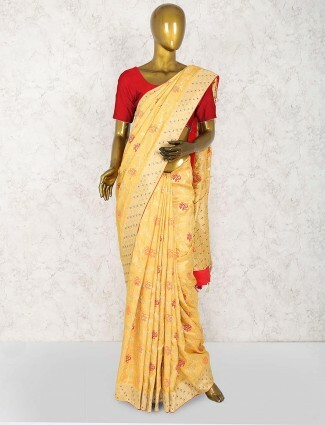 A Silk saree in banarasi silk is a traditional party saree which never fails to impress the crowd looking rich in almost all colors from red, gold or black. 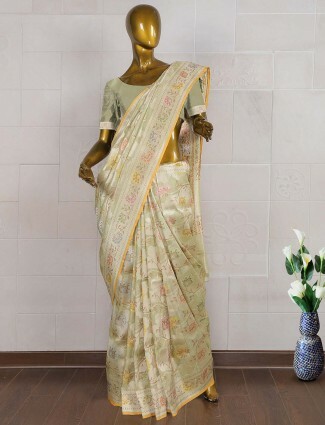 A zari border or weave on the pallu or blingy embellishments on saree pallu or shoulder placements are the new designer concepts of party wear sarees. 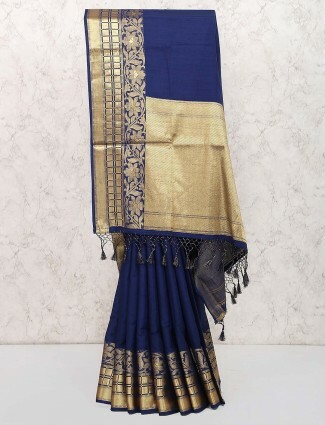 Shop all styles of party wear saris at g3fashion.com in a premium category to a budget range of cottonsilk sarees, bhagalpuri sarees, linen sarees or any printed concepts in vintage blue prints to floral printed party wear sarees. 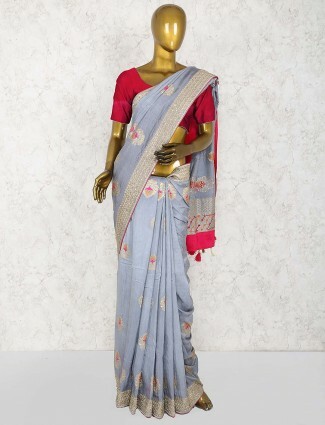 You can also go for pompom sarees or hand printed sarees, the appliqué work sarees in kantha embroidery to kalamkari sarees being the new rage of party look.